Sunday School brings together youth from age three through eighth grade with dynamic teachers and exciting projects. During our 9 am Worship Service, our youth begin in church for the first part of the service and then may attend Sunday School after the Children's sermon. Teachers use bible stories and crafts to teach our youth about their faith. Every Christmas the youth put on a special Christmas pageant. Confirmation, although not a sacrament in the Lutheran church, is a cherished ritual and rite of passage. The program involves strengthening or deepening one's relationship with God. At the completion of the program (2 years) students will publicly reaffirm the promises their sponsors made for them at their Baptism. Once again, this year at Holy Trinity we are inviting youth in grades 6 and up to participate in the Confirmation Program. Confirmation classes will be a combination of Sunday School Class (during 9 am service) and a once a month class with the pastor on Sunday from 12 pm to 1 pm. We will be using scripture, books and music to understand our faith and learn the catechism. In addition to class attendance, students will be expected to attend worship regularly as well as participate in worship as acolyte, reader or usher. For more information, speak to our pastor. During Advent and Lent we offer a Midweek Service with a soup lunch following the morning bible study. See seasonal worship. The Bible Can Be Fun! 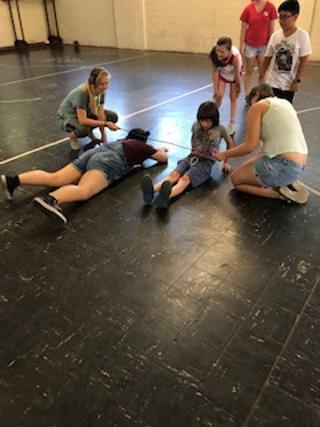 The youth of Holy Trinity attended the Junior / Senior High School retreat hosted by the Lutheran Youth Organization of the Metro New York Synod at Crossroads Camp and Retreat Center in Port Murray, New Jersey. The theme for the retreat was “Masks”, Matthew 26: 69-70. The kids spent time exploring how we all wear different masks in our lives and in our faith. The keynote speaker, Pastor Wolfgang Lauder of Christ Church in Staten Island, led an engaging and insightful discussion of the many masks and roles each of us takes on and how we can work to unmask our Christian faith. 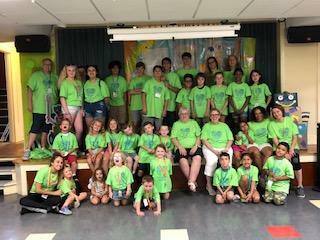 There was also plenty of opportunities for fun and fellowship for kids to meet new friends, reconnect with old friends, and to feel surrounded by other kids who share their Christian beliefs. There was a lot of singing, dancing, games, and even a few snowball fights. 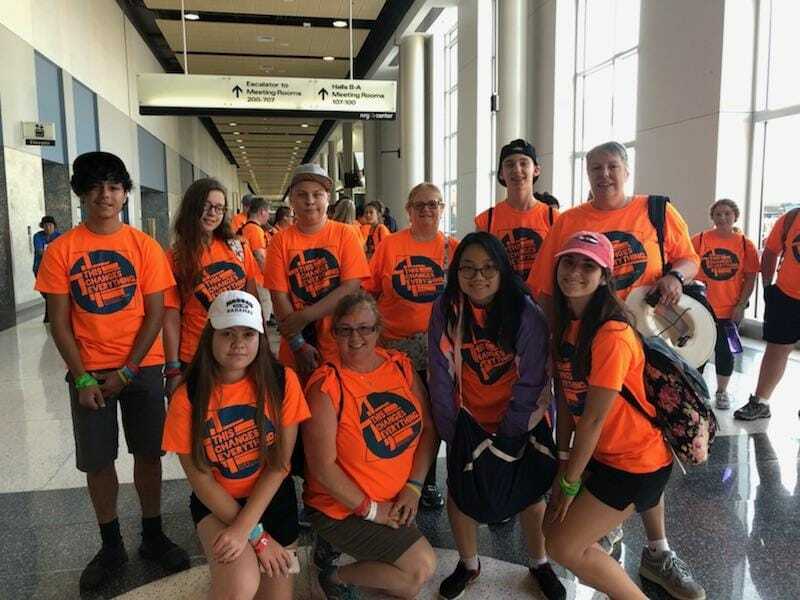 Many thanks to Diane Gilroy, LYO Director, and the LYO Board for all of their hard work to make this an unforgettable experience for our youth! 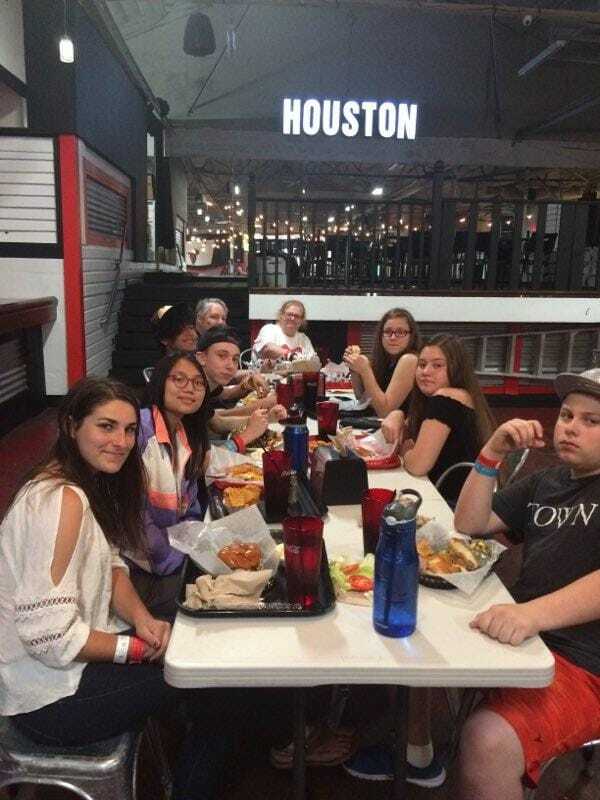 Our Youth Group meets the first and third Saturday of each month. Youth in 9th grade and up meet from 8:30 - 10:30 pm. We turn no one away and all are welcome. Come join us! And hey . . . bring a friend! Ms. Diane Gilroy is our Youth leader and is always seeking people to help coordinate youth activities. The youth group meets in the fellowship hall on our lower level. 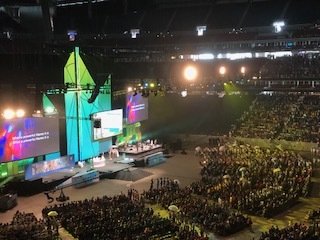 Plans are underway for our youth and adult leaders to attend the 2021 ELCA Youth Gathering in Minneapolis, Minnesota. 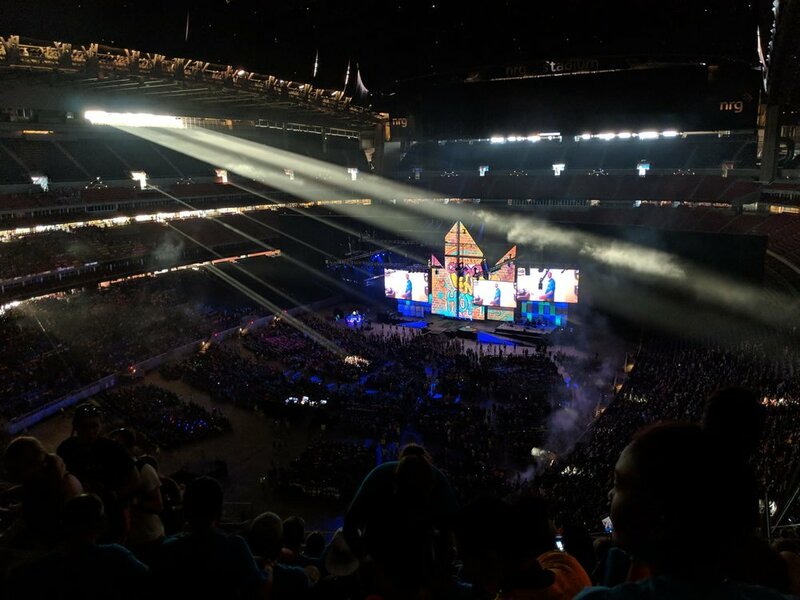 Browse through the pictures from our trip to the 2018 Youth Gathering in Houston, Texas and our trip into NYC to see the Christmas Tree. All women of Holy Trinity, and their friends, are invited to join us once a month for fellowship, movies, book club discussion and support. Past book studies have included ‘The Shack” and “Courageous.” We are currently working through “The Worn Out Woman.” We come together to support each other, share food, complete service projects and sometimes just share our day. Meetings usually take place the 3rd Wednesday of the month at 7 pm. See calendar event. The Men of Holy Trinity gather once a month for fellowship and service projects. This past summer they refurbished the kitchen in our gym and put felt pads on our chairs in the Fellowship Hall. Twice a year they go out to dinner. See calendar event. During the year we run various outreach events which are open to the entire congregation. Scroll down (Welcome- Outreach) for more information. At Holy Trinity we know that our work extends far beyond our walls. Each year we work together to serve our neighbors near and far. Two of our ongoing programs are Midnight Run and Meal Packing. Each year we add various other programs as special outreach initiatives. In 2018 we donated over $4000 worth of chickens, goats and medical supplies through ELCA Good Gifts, In 2019 we are off to a great start with our Dress for Success program. See events page for information on how you can participate in our next event. Our last run was a breakfast run in January 2019. We distributed close to 100 pairs of new waterproof boots and socks for the homeless. We also provided hot coffee and egg sandwiches to our friends living on the streets. In 2017 we also provided over 100 pairs of new boots for the homeless of the city on New York. Please help us exceed that goal for our next run. In over 1,000 relief missions per year, Midnight Run volunteers from churches, synagogues, schools and other civic groups distribute food, clothing, blankets and personal care items to the homeless poor on the streets of New York City. These late-night or early-morning relief efforts create a forum for trust, sharing, understanding and affection. That human exchange, rather than the exchange of goods, is the essence of the Midnight Run mission. For more information about Midnight Run contact them at www.midnightrun.org. We continue to help feed the hungry of New York by putting together meals for the various food pantries in our area. Some of you have heard of a very special organization called Outreach which provides nutritional meals for those who are less fortunate than most. Our volunteers form assembly lines to package and box complete meals for distribution to local food pantries. In Fall of 2018 we packaged over 17,000 meals with the help of over 50 volunteers. In 2016 we organized a community meal packing and packed over 50,000 meals. Thanks to the Plattdeutsch Restaurant for letting us use their dining hall. 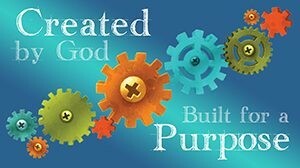 For more information about Outreach you can visit their website at Outreachprogram.org. We are blessed to have Daisy through Ambassador Girl Scout troops meet in our building during the school year. We also serve as the Queens Cookie Cupboard each spring during GS Cookie Season. 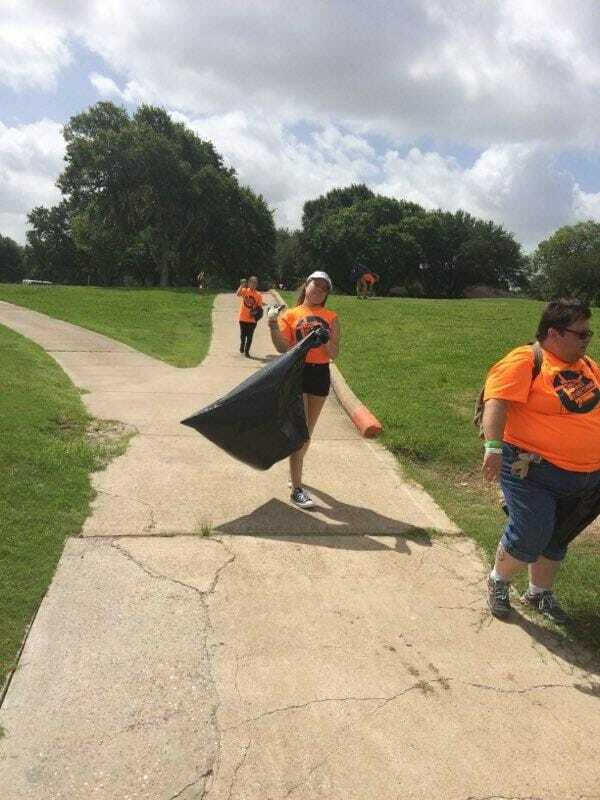 Supporting young girls and helping them grow into mature young ladies through healthy activities is one way we reach out into our community. For information on these troops and meeting times please contact us through this website. These groups discuss concerns of the neighborhood and work together to make Bellerose a great place to live. 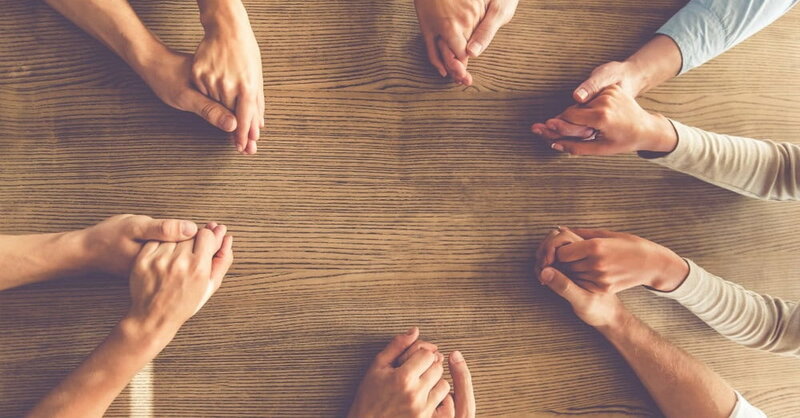 Alcoholics Anonymous meets in our gym Tuesday and Thursday at 7:15PM. These are closed meetings except for the last Thursday of the month. For more information contact them at www.queensaa.org or in an emergency call the 24 hour hotline at 718-520-5021. Our Little Angels is a daycare organization housed in our parish hall. It has been here for over ten years and provides daycare and educational opportunities for children from the ages of two through four. Holy Trinity serves as the training ground for regular free Real Estate Continuing Education classes. Contact Doug Vairo at dvairo@icghome.comfor information.